A charming story that will definitely put you in the holiday spirit. I enjoy reading Dickins and the cover is beautiful so I couldn't pass it up when I saw it on NetGalley. And the story within the cover is equally beautiful. All I really knew about the publishing history of A Christmas Carol was that Dickens was reluctant to have it published. I thought it was a story he had written for his children. Apparently, he was known to create plays for his children to act in on Christmas. Silva takes a few liberties with the historical record, which she admits to in the afterword. I don't mind when historical fiction writers fill in blanks or fabricate conversations or invent minor events in the effort to create a richer story about real people or real events. Though I find changing documented details distracting and pulls me out of the story. That is the case in the opening chapters of this book. It caused me to chase a rabbit on Google. I wish the author had mentioned her liberties at the beginning of the book instead of the end. It had me questioning the authenticity of other details and how much time Silva spent on research. What really bugged me was she had Dickens with 5 children and a sixth arriving in the fall of 1843. In fact, Francis (the 5th child) wasn't born until January 1844. Since it seemed essential to the story that Catherine be experiencing a bout of post-partum depression (which is a documented fact), why not have Francis being born in fall of 1843 instead of Alfred? But once I got past this annoying detail, I really enjoyed the story. I thought Silva got the language of the 1840s right, and close to what I remember from A Christmas Carol, which helped immerse me in the world that Dickens inhabited. The descriptions of London and the other characters brought it all to life. I found myself delighted with the delivery of several lines. I didn't see the twist at the end coming, but it did explain some of the odd interactions that occurred. It also fits in nicely with a literary trope that was popular during that time. Combined with the language, it made it feel more like a classic than a contemporary novel. 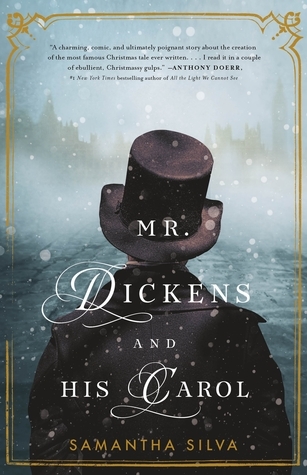 I don't usually start reading Christmas stories until after Thanksgiving, but after finishing Mr. Dickens and His Carol it is all I want to read. If you are needing a little help getting into the Christmas spirit this season, I highly recommend picking up this delightful tale.